Keeping all floors clean including laminate floors for a longer time between wet cleaning is important to residential homeowners because it allows the homeowner to increase the time period in between wet cleaning. Let’s be honest, most people do not like cleaning. So if you can extend the time in between cleaning laminate floors, it saves the homeowner time and reduces the drudgery of cleaning tasks. 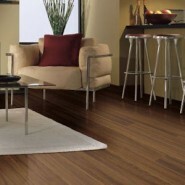 The goal of this article is to provide our readers with how to clean laminate floor less often. This is accomplished by a simple but very effective preventative tool. A tool that is practical to achieving this goal but also a tool that can be decorative and enhance the beauty of a home. Hoe to clean a laminate floor less often is can be achieved by using floor mats. If our readers are more interested in the actual cleaning steps for laminate floors, please refer to the following link on daily cleaning procedures for how to clean laminate floor (How to Clean Laminate Floors – Cleaning Procedures). Floor mats perform two main functions; keeping laminate floors cleaner longer. Traps loose soils such as grit, sand, dust, etc. from soles of shoes and to a lesser extent loose soils that are blown in from the outside. Blots and traps wet soils such mud, stains, etc. from the soles of shoes. Prevents loose soils from entering the home and onto the laminate floors. Prevents wet soils from soiling the floors through normal foot traffic entering the home. Today there are a wide variety of shapes, sizes, colors and designs on the market which actually can make a home inviting and more beautiful looking laminate floor. So far we have described floor matting as way to prevent soils from entering the home’s floor. However carpet runners or area rugs can be placed in other areas of the laminate floor that will provide how to clean laminate floor less often. In front of seating furniture like sofas, chairs, etc.